VPPUP UP ITI admission application forms 2019 @ vppup.in for academic session 2019-18 are expected to release in the first week of May 2019. VPPUP ITI application forms will be issued by the Rajya Vyaavasaayik Prashikshan Parishad, Uttar Pradesh on the specified dates. Under this, eligible candidates of UP will get admissions to ITI certificate programs in various Govt. and private Industrial Training Institutes (ITIs) of the state. Candidates should apply before the last date, as late applications will not be accepted under any circumstances. If you also interested in 2019 admissions, then you must also go through the information brochure before filling the application. For detailed information, you have to wait for the issue of official notification. You can go through the given article as we have shared all the necessary information about the admission in it. The information provided here is based on the previous year data. 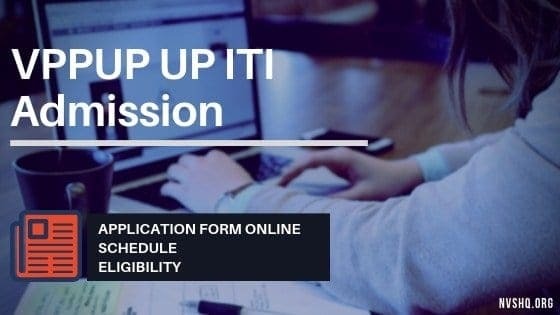 In this article, you will get a detailed information on VPPUP ITI admission 2019 application form, exam schedule, exam fee, eligibility criteria, courses/trades, reservation, exam pattern etc. Seats will be allotted to the candidates in four different phases. The duration of these Engineering and non-engineering training programs can be from six months to 2 years. VPPUP ITI applicants must read all the instructions and eligibility criteria carefully in the candidate’s brochure. Once they have ensured that they satisfy the eligibility criteria they can proceed further for application. The minimum of the candidate must be 14 years as on 1st August 2019. There is not an upper age limit. No rebate is permissible to any candidate in the minimum age limit. Applicants must have completed Class X (SSC/High School) or equivalent from a recognized Board. However, candidates can also apply on the basis of class 8th for certain trades. Class 10th appearing candidates also eligible. Applicants must be mentally and physically sound. Candidates with 40% or more disability can apply under the 3% reservation criteria. Candidates should not have any defect in the eyes. Visit the official website (www.vppup.in) of the conducting authority. On the homepage of the portal, you have to find and click on the “Online Submission of Application for Admission for Session 2018-19” link. In this stage, you have to fill the personal information, qualification details, reservation information etc. in the application form. Candidates also have to upload the scanned copy of the passport size photograph and signature. You must preview all the filled information and make necessary corrections if you have filled some wrong information in the form. Click on the ‘Proceed for Payment’ option and make payment of the prescribed registration fee. After reviewing all the information click on the “submit” button for final submission of the application. In the last stage, you have to download the filled in application form and have to take a printout of the same. This printout needs to be kept safe for future use. Admission in UP ITI is based on the merit list. After the completion of the application procedure, admission authority will prepare merit list of applied candidates based on their marks in 10th and 12th Class. There is no entrance exam for VPPUP UP ITI 2019 Admission. VPPUP UP ITI Admission online application forms are going to release most probably in the month of May 2019. Candidates are advised to go through all the instructions in the applicant’s brochure before filling the application form. Incomplete and wrongly filled application forms will not be considered in any condition. No modification in the application form is permissible once candidates have submitted the application form. Applicants must keep 4 copies of the photograph (as uploaded in the application form) safe with them throughout the admission procedure. Applicants can fill preferences of maximum 10 trades in the 6 institutes of any of the 3 districts of the state. Seats will be allotted only on the basis of the merit and preferences filled the candidates. Candidates will be intimated about the seat allotment result through the official website, registered mobile number, email. It will also be published in the newspapers. Keep visiting this page for all the latest news and updates regarding the VPPUP ITI admission. In case of any assistance or query, you can drop you comment in the comment section below. Abhi Application Form aaya nhi hai. Jaise hi aaiga hum inform ker dege. Sir mera 51% h kya mujhe admission mil skta hai???? Sir, i have waisted one year due to less income. But i have a electronic training government certificate sixth month. And i want to do ITI from Up. I able to do this trade as i am passed from CBSE board. please update your article…….the information you have provided under section exam pattern is wrong. There will be no exam for UP ITI admission 2019. Selection based on order of merit. l am salika kumari. l have passed 12th with 66 per cent. please tell me on which college .l will be able to take admissioon. Thanks for your valuable information. We will look into this.